Major X has come to the past or well more an alternate dimension/reality to save his world that has been destroyed. Does that sound familiar? Well it should because its one of the most overused stories ever told, especially in comics. That's not all, almost everything about this book is completely unoriginal. I'm not sure if Rob Liefeld took this idea to Marvel or Marvel asked Liefeld to write a mini-series and gave him full reign to do as he pleases, but this book is an absolute mess. The story takes place at the dawn of X-Force way back in 1991, and while you would expect this to be a modern comic taking place in the 90s it is anything but. 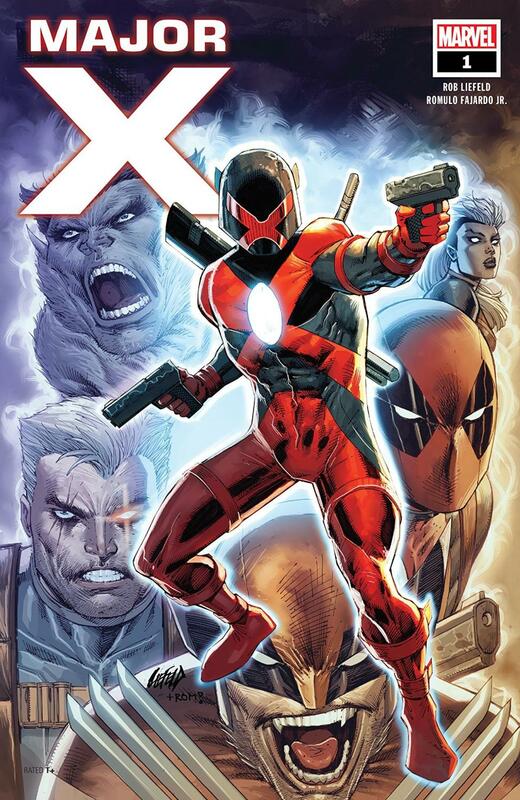 I think Liefeld thought he was being clever and paying homage to 90s comics but it doesn't come across that way. He is a creator that has the reputation of not evolving with comics and being stuck in the past. This book clearly shows how much that is true. I almost feel like this book was written and drawn back in the 90s and has since sat in Liefeld's desk drawer until the day Marvel said "hey write us a X-Men story" and Liefeld just pulled it out and handed it in. The book is painfully that much out of touch with modern day comics. Once you get past the poor art with wonky faces, and disproportionate bodies you get sacked with the grade school level of dialogue. All the characters talk in one liners and in the third person which gets very old, very quickly. Another part of the writing that bothered me is Liefelds choice of names and having to constantly repeat them. X-Ential and X-Istence are two that really stood out because they get mentioned on so many pages and sometimes multiple times on the same page. It's almost like Liefeld thought we would forget who he was talking about so he had to keep repeating it. I also found the names very unoriginal. I know it is a thing with x-books to have the team or company have a name with an X at the start, but in this instance it's way too cliche. Some of the art in the book is actually pretty good. There are some with great detail and those panels and splash pages seem pretty exciting and dynamic. Though then right before or after them are tons of panels with sloppy art and it just then manages to drag the rest down with it. Again this book feels like no effort was put forward and was just slapped together. Overall this book is one giant cliche. There is nothing original about it, right down to the surprise of who Major X is at the end of the issue. With so many X-Men books on the market right now that are really good, this one will just get lost in the mix. If you have read every other current x-book and still need more, then find some back catalog you haven't read and skip this altogether. This is a hard pass.